There are only advantages when it comes to being a woman in the workplace. Despite being a “woman in business,” I’ve rarely thought of myself in that way. Instead of focusing on my gender or any implied limitations I might bring to the job as a female and a mother, above all, I focused on building a brand. The number one thing I relied on to help me advance in my career is what I like to think of as my business superpower — making decisions, quickly and confidently. Of course, it’s important to be flexible in your ability to react and adjust to trends and competition, but setting a course of action has always served me better than waffling in indecision. Every day there are decisions to be made, and most often it’s not until much later that those choices become recognizable as big decisions that change or shape your business. Passion absolutely plays a role here. When you feel strongly about something, you’ll be able to trust yourself and your decisions. Consult others for advice, but not answers. The key to making decisive decisions is trusting your intuition. Some of my decisions even went against the recommendations of everyone around me, but when it came to color (my expertise), I always trusted in myself. Practicing patience is another underrated career lesson. It’s considered a virtue for a reason; patience goes a long way in the world of business. Having patience in the workplace will lead to an open-minded approach to business and flexibility in decision-making. Building a business is slow work, and patience is necessary when it comes to nurturing relationships, overcoming the inevitable challenges, and staying committed to a long-term vision. Having a sense of humor is key. It’s important to laugh — especially at your mistakes. Humor will give you grace and can help alleviate stress, giving you a sense of calm and even perspective. A smile on your face will allow your coworkers to perceive you in a positive light, and this positivity will shape the mood of your workplace. Surrounding yourself with support is crucial when it comes to personal success. There are only 24 hours in a day. You can be an expert at many things, but not everything. Running a business is very hard work. Why not share the burden with others who can offer their own unique strengths? Find someone you can collaborate with who brings something new to the table and complements your talents. Once you’ve partnered with or employed others who share your vision, step back. Don’t be a micromanager. Instead, empower your team and let them do their thing. Giving employees their autonomy is like giving them a vote of confidence. After all, you’ve hired them to take work off your plate so you can focus on your own tasks. In doing so, you allow everyone to take ownership of their responsibilities and become personally invested in their jobs. 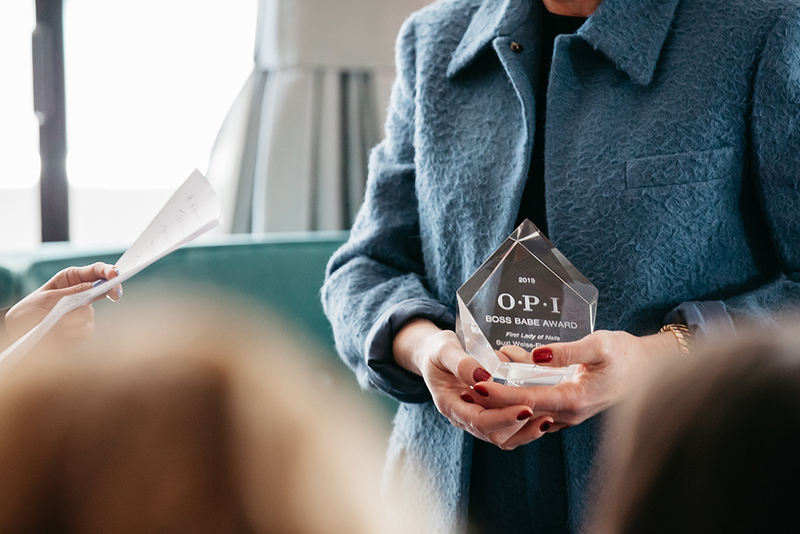 For this very reason, I had employees who stayed at OPI for decades, working their way up in the company as truly invaluable assets who helped the brand succeed. I think there are only advantages when it comes to being a woman in the workplace. I try to go into every business situation with positivity. Women are go-getters, organized, financially savvy, creative, great multitaskers, global thinkers – we handle so much. Women are talented! Knowing that, and having confidence, is so important.